IoE vs IoT . . . So IoE brings together people (humans), processes (managing the way people, data, and things work together), data (rich information), in addition to things (inanimate objects and devices). Collectively, they make networked connections more relevant and valuable than ever before. 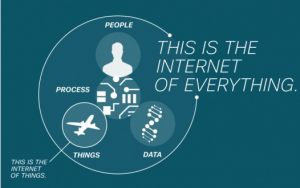 So in essence, IoE (four pillars: people, process, data, and things) builds on top of IoT (one pillar: things). In addition, IoE further advances the power of the Internet to improve business and industry outcomes, and ultimately make people’s lives more enriched as a result. EoIP, more than just your voice . . .
Over the past 20 years, we’ve transitioned from just your voice being transmitted over IP to ‘everything’ being connected via IP (EoIP). Today, products such as your thermostat, to your refrigerator to your watch can be connected to an IP address. 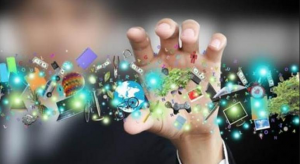 But its more than just technology for consumers, the public sector is embracing IoE as well. For example, the Department of Defense [DoD] has connected sensors to helmets, vehicles, weapons and unmanned aerial vehicles (UAVs) to enable real-time awareness of what’s happening on the ground. These sensors are so advanced, they can collect data on brain injuries incurred during combat. Additionally, the DoD is incorporating enhanced connected applications for base facilities management, vehicle management, logistics and transportation to allow for data that can be collected as its happening on the battlefields. Moving to an EoIP environment has also helped the healthcare industry. Doctors and medical care facilities can use automation to send patients text message reminders for upcoming appointments and medical treatment follow-ups. This simple solution reduces the amount of missed appointments and enables doctors and nurses to use their time most efficiently and effectively. Also, the sharing of personal health data securely over IP allows all parties to be increasingly mobile, allowing for health care professionals to learn more about a patient’s medical history, no matter where they are located. With rewards, comes risks . . . However, while technological sharing and connectivity offers benefits such as reduced costs and time-savings, it also presents increased cybersecurity threats for those who are beginning to rely on the IoE. The stakes are exceedingly risky at the federal level, particularly since a large amount of its citizenry’s sensitive data is kept in data banks by the government. Defense agencies, specifically face increased cyberthreats from individual hackers and other nation states. To secure data centers, the federal agencies’ talent pool needs to be well trained and increased in size to meet the burgeoning EoIP demands, as it grows exponentially. They need to comprehend today’s evolving threat landscape to establish comprehensive cross-department solutions that will assist in identifying and mitigating threats. With the right approach to cybersecurity, agencies can realize real value from new network connections, while maintaining data privacy and network security. Soon to become the baseline . . . 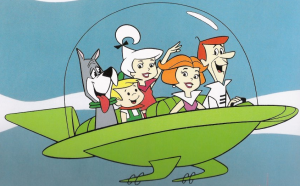 The Internet of Everything might appear to some as too futuristic – perhaps a little, too Jetson-esque. But, when you think about it, many of us felt the same way about VoIP when it was first introduced. The reality is EoIP is connecting the unconnected to offer new capabilities, richer experiences and unprecedented economic opportunity across all sectors and demographics. By harnessing the power of connectivity, we can track and share anything from the location of an aircraft in another country to a patient’s medical records down the street. With a strong cybersecurity component included, the public and private sectors will be well positioned to take advantage of IoE’s benefits and maximize the opportunities that exist in the ever-evolving ‘Everything-over-IP’ world. It’s likely a few decades from now, we’ll talk about IoE technologies as the baseline standard, the same way as we talk about VoIP today.